Scott L. Montgomery explores how climate change deniers have had the monopoly of ideas around energy use in the United States of America. Does this apply to the domain of energy? Very much so. Consider just a few examples. Case in point: the disaster in Venezuela, where two decades of Chavismo (Hugo Chavez’s socialist “revolution” funded by oil dictatorship) has virtually destroyed the petroleum industry in the world’s most oil-rich nation, thus the country’s economy. No small part of this has been the flight and the jailing of Venezuela’s intellectuals and oil industry professionals, including geoscientists and engineers. Then there’s the idea of “energy security.” Despite official definitions, this has been viewed by governments in a mercantilist manner: maximize domestic resources, minimize imports. Even knowing what the effects would be, China and India chose coal, their most abundant fuel, to power massive industrialization. That this was a form of “madness” became clear soon enough. Hundreds of thousands of people die prematurely each year in each country. That this will mean higher costs, financial and social, than having made other choices can’t be doubted. A third example: the idea that nuclear power defines a dirty, dangerous, exorbitant, baneful, evil technology which must be abandoned. That no evidence supports this, nor the notion that radiation means cancer and death, makes no difference. For far too many people, fear remains a fixed idea that hasn’t been seriously re-evaluated even in the new context of climate threats. In the U.S., such fear killed growth of new nuclear plants, greatly aiding a 60% rise in coal use from 1980 to 2010. If even half of the >120 reactor cancellations had been built, U.S. emissions would be below levels called for in the Kyoto Protocol. These examples help illuminate something. Ideas about energy and energy policies often need revision in the light of new information, new situations, new needs. It’s not only scientists who should modify a view or hypothesis when new evidence arrives. That has not happened for one of the ruling political parties in the U.S. Lack of leadership by America on climate change is almost certainly a core factor in the world’s continued half-willingness to reduce emissions. For many decades, the U.S. has been the world’s most powerful nation in such key areas as wealth, military capability, political and diplomatic influence, science and technology, and soft power as well. What comes from this, due to the inexorable logic of power itself, is a higher responsibility to lead by precedent in cases of global crisis. Such responsibility is wholly practical, concrete It does not need moral or ethical arguments, though these are present, to). And it is exactly here that the U.S. government has utterly and irrevocably failed on the climate issue. Donald Trump counts as the culmination of this failure, but only the culmination. In his clownish and malignant disregard for science, his rabid and relentless attacks on environmental protections, and his windy proclamations about a new era of “energy dominance” for America, he stands as the ultimate sign of what the federal government has become since extreme ideas came to Washington and before long became orthodoxy in one of the two political parties. Beginning with the Reagan-Thatcher period, these ideas brought a shift toward anti-government fervor and free market fundamentalism. Reagan’s own far-right conservatism, much of whose core can be found in Barry Goldwater’s manifesto, Conscience of a Conservative (1960), as well as F.A. Hayek and Milton Friedman, turned government into the arch enemy of the people and the private sector into the fountain of virtue. Such ideas are probably familiar to many readers of this journal and require little elaboration. But what have they meant for energy? The answer returns to three basic concepts: 1) national energy problems need market solutions, not government “meddling”; 2) government should get out of the business of supporting energy R&D, as it belongs to the private sector; and 3) regulation is a shackle on the private sector and thus progress, and threatens to give government full control over matters dealing with the environment. Of course, there was always a wink here, since “market solutions” included use of the U.S. military in the Persian Gulf to ensure an unrestricted flow of oil to the right places. But Reagan himself proved himself true to principle. He soon killed a host of R&D programs, especially those for renewables (Elder Bush and Bill Clinton would kill those for nuclear a decade later). He also appointed people who slashed the reach and authority of the Environmental Protection Agency (EPA). And he put in play major incentives for carbon fuels. Through the 1980s, coal use surged, as did oil consumption and dependence on imports, as alternatives were starved or ignored. The ideas of less government and “market solutions” were then further hardened by the so-called Republican Revolution of 1994. Two decades of low oil prices (1986-2004) also helped remove any urgency for serious change (“the market is working!”). By the early 2000s, oil imports had grown to 60% of consumption, nearly half of this from OPEC nations. 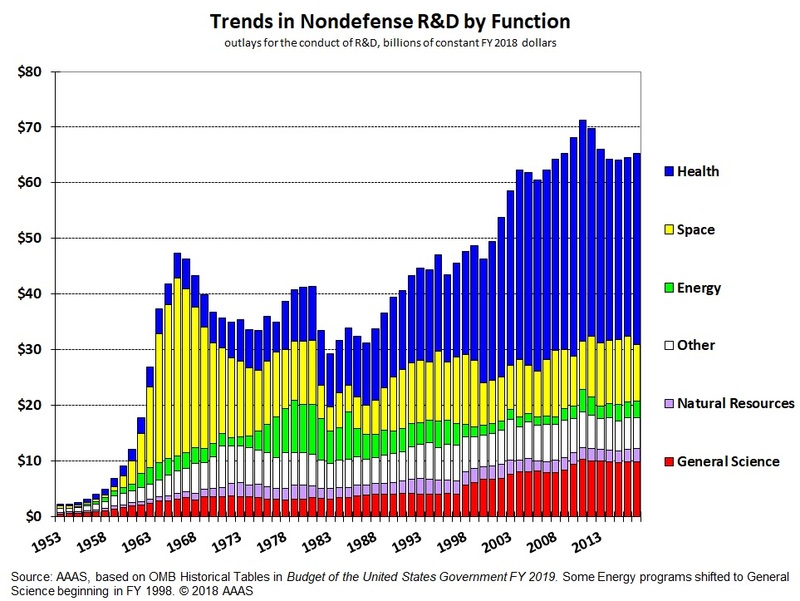 Government R&D for energy, meanwhile, shriveled to barely a tenth of what it had been in the 1970s. The ideas guiding energy policy since the Reagan Administration had created a situation that deeply compromised the country’s national and economic security. Without any attempt to reign in demand (fuel taxes, fuel economy standards, major support for public transport, etc.) or invest in alternatives to oil, hundreds of $billions had flowed to authoritarian regimes, even as Persian Gulf states became the locus of terrorism. No small amount of U.S. money spent on “foreign oil” inevitably ended up in the hands of “charities” that funded al Qaeda, thus perhaps the 9/11 bombers themselves. Meanwhile, U.S. calls for improving human rights and democracy around the globe were made to sound hollow and self-serving at best. Climate denial had help, unfortunately, from an uncritical media driven by its own fixed idea of “balance.” For over a decade, the situation was regularly portrayed as akin to a “science controversy,” with both sides deserving coverage and credibility. Claims today that the media were hoodwinked, mainly by a band of propagandists pushing the lie of “uncertainty,” don’t hold water. Granting “equal time” to non-scientists and a handful of researchers who rejected a global scientific consensus was foolish and profoundly irresponsible. Yes, its been corrected. But 10+ years of potential public awareness was lost in the shuffle. At the same time, media correction or no, right wing climate denial has remained unabated and undaunted. Such an anti-science pose has been hard for many people to fathom. How can Republicans, who put such faith and funding into defense R&D, turn so vehemently, even venomously, against scientific knowledge? Aside from pandering to their political base, who they themselves (along with talk radio and social media) had helped orient against climate change, they had another idea to wield in anger. This was fear of federal power in the realm of nature. It begins with the standard conservative idea of limiting government power (a respectable stance since Edmund Burke), but then takes a hard right turn into a kind of paranoid domain. Giving the federal government purview on climate change, that is, would also mean granting it full power over a huge array of economic and social realties, not least how we get our energy. Some real light in the dark of such notions came with the Obama Administration. The only president ever to appoint scientists to run the Department of Energy (Steven Chu and Earnest Moniz, both physicists), Obama took climate change seriously and sought to break the hold of market fundamentalism. With brief and slim majorities in Congress, he was able to advance non-carbon energy R&D, giving support to renewables via tax credits and direct subsidies, plus new funding for nuclear and other alternatives to carbon sources. He did not seek to end the new era of oil and gas production via fracking (on the contrary) or do away with coal and its already economically troubled industry. Yet Obama faced a reactionary wave that demonized his support for climate action, stifling his Clean Power Plan till it was killed in court. Some readers may feel that I tilt the frame. Doesn’t all this blaming of the right go too far in one direction? Perhaps. After all, the right couldn’t have gained so much high ground if the left had truly defended it. Many have stressed this, and, having witnessed the events, I hardly disagree. Moreover, some Democrats in the 1990s moved rightward themselves, taking up what has been called (somehow without irony) “progressive fiscal conservatism,” and scoffing at the Kyoto Protocol. They moved, so they thought, toward the center. It was a center, however, that had itself already shifted rightward no small degree. And yet, Democrats did not, en masse or even significantly, abandon science. Neither did they portray scientists as naïve elitists who cared more for data and theory than people and society. Nor did they ridicule the IPCC reports that appeared in 1996, 2001, and 2007, or ignore national science academies around the world who stood in support of these crucial documents. Democrats also took no part in the ruthless personal attacks on individual authors of climate reports. And they have not, like certain conservative groups and Republican Congress people, set out to accuse, harass, intimidate, and silence researchers in academia and government. Enter the Green New Deal (GND). This has been under a neon glow for weeks now, and it remains the target of much happy and unhappy attention. Most energy experts have viewed it as wholly impractical, distracting, even childish. In terms of its stated energy goals, taken at their word, all of this is accurate. The primary goals initially included: eliminating all use of fossil fuels in a decade or two; going 100% renewable in that same time frame; eliminating R&D into all other low- and non-carbon sources; transforming nearly all ground transport into electric vehicles (EVs). Virtually every one of these goals is not merely impossible but absurdly so, absent belief in the magic powers of good intentions. The one exception is liquidating R&D on non-renewable energy sources, something proven as achievable by the Reagan Administration’s own elimination of funding into renewables four decades ago. That the final text of the GND House resolution, H.Res.109 spoke of a “10-year national mobilization” and attached to some of its primary goals the phrase “as much as is technologically feasible”, doesn’t alter the overall picture. Taking more than 260 million cars off the roads and replacing them with EVs, and shutting down more than a million oil and gas wells plus 2.5 million miles of pipelines, including natural gas lines that heat more than 100 million homes and buildings, and doing so in 10 or even 20 years seems, how shall we say, a bit fanciful. So it makes sense to view and understand the GND in a different way. Read as a manifesto, it becomes a singular kind of document. Its extremism becomes justified in matching and opposing, almost point-by-point, the climate denying zealotry that defines Republican orthodoxy. An image from the left whose very impossibility is the sign of the radical refusal by the right to accept the reality of climate change. I don’t think it should be ignored that in its very name, the GND brings forward everything the far right has tried to crush and assassinate, everything that it fears for the future—a radically different worldview, with environmental-climate priorities at the helm, forged and funded by an “activist” government that has returned to a supporting role for public goods and the public good. “A specter is haunting American energy…,” we might say. Such is how the Republicans see it, the GND in league with Marx and Engels. The truth, instead, is that a change in ideas may be in the wind, if not yet fully on the ground. The danger here, as too few readily admit, is that GND energy policy be taken literally as its own final and unquestionable solution—a new immobile set of ideas to replace those of its opponent. Scarred veterans of the political scene might well attribute any such change to the simple fear of a fall from power. Besides the new Democratic majority in the House, polls now consistently show a far greater number of Americans are seriously worried about climate impacts. But more, I think, is at play here. What sorts of plans are being offered by the right to deal with the climate problem? We should be less than shocked to find, as one leading example shows, that the sober gods of “market solutions” and private sector “innovation” are invoked, while the evil spirits of regulation and significant government R&D are banished. In a word, climate change itself, in all its immense and growing threat, becomes yet another argument for the very market fundamentalism that created the very peril we now face. There is a conclusion to make from all this, a hard, bitter but necessary one. Commonly left unsaid, it is widely felt, and not only by those on the left. America under Republican control, now with Donald Trump in the White House, represents a long-term menace to the world’s progress against climate change. It even makes sense to go further than this. When the Soviet Union collapsed in 1991, the U.S. found itself with a magnificent field unfurled at its door. For well over a decade, America. had no rivals. Russia lay weak in its own economic ruins, while China’s GDP per capita had yet to rise above India’s. At this same moment, America entered one of its longest periods of economic prosperity, utterly erasing the national debt and even creating a surplus. Flush with wealth, unparalleled in power and influence, the United States had been handed by history the opportunity to do profoundly positive things for itself, the world, and the future. It seems ironic that one true achievement that did emerge from this moment—securing of the far-flung Soviet nuclear arsenal and related materials—was a bipartisan effort that directly involved the scientific community. Important and essential as this was, it represented only one of several demands for global leadership. Another, which now seems likely to have been of equal or even greater importance, was to unify as much of the globe as possible behind fully investigating and beginning to seriously deal with the climate threat. U.S. leaders had a chance to inform the citizenry of what could well lie ahead, what risks would have to be faced, what changes of mind and action would be needed. All of which could have been argued on domestic terms, for the sake of public welfare and national security. The historic moment lasted just over a decade, and the U.S., then the world’s largest emitter, did worse than nothing. It turned climate change into an accusation against its political opponent and against science itself. Republicans were in charge of Congress virtually the entire time, from the early 1990s to 2006, and with their anti-government, anti-environment, anti-science agenda in hand transformed the U.S. political scene into landscape of brutal partisanship, expelling moderates, and relentlessly working to destroy the legitimacy of Democrats and Democratic issues, including climate change. By any measure, America squandered its moment. And it did so in no small part due to a set of immobile and uncompromising ideas and those who embodied and nurtured them. The result, today, and the conclusion that can no longer be denied is that America under the Republican Party and now Donald Trump represent a menace to the world’s progress against climate change.